Now there are Donald Trump Popsockets that makes holding your phone a lot easier. Popsockets are easily stuck to your phone or tablet and can be removed and replaced if needed. This Popsocket is black and on the end it has an image of President Trump in front of the US Stars and Stripes flag. 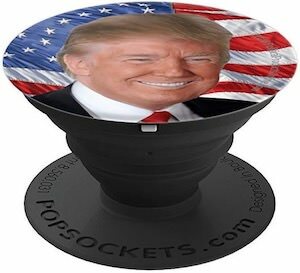 Your Popsocket can fold almost flat when not in use and when fold out you can use it to hold your smartphone easily or you can use it as a stand to watch movies or things like it and they even have holder for your home or car so that you can have your phone or tablet just hanging around. So if you want Donald Trump on the back of your phone then this could be just perfect for you.